A large crowd gathered at the University of Maine at Fort Kent Old Model School Building on Sunday, Nov. 11, to mark Veterans Day and the 100th anniversary of the end of World War I.
FORT KENT, Maine — A large crowd gathered at the University of Maine at Fort Kent Old Model School Building on Sunday, Nov. 11, to mark Veterans Day and the 100th anniversary of the end of World War I.
Fort Kent Community High School French educator Robert Daigle reads a poem by WWI soldier Ralph Moan of East Machias, at a Veterans Day gathering at UMFK on Sunday, Nov. 11. Next to Daigle are high-school exchange students from Cholet, France, along with CHS students with whom the exchange students are staying. 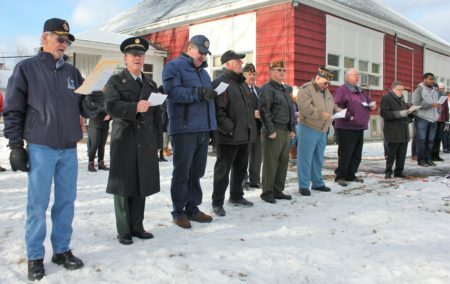 Members of American Legion Post 133 and the UMFK Student Veterans Association organized the event at which legionnaire Duane Belanger helped members of Boy Scout Troop 189 raise a United States Flag. 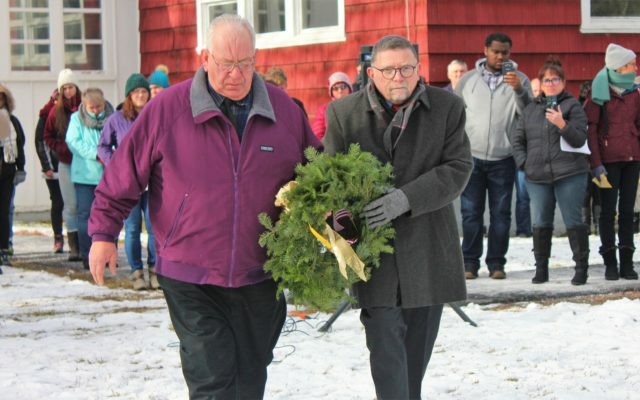 UMFK President John N. Short and Vietnam Veteran Melford Pelletier laid a ceremonial wreath at the base of the flagpole. 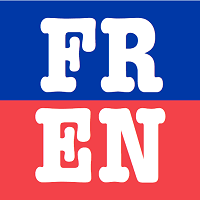 France and the United States were allied forces in World War I. Veterans join community members in singing “America the Beautiful,” at a Veterans Day ceremony at UMFK on Sunday, Nov. 11. Daigle told the crowd that during WWI, roughly 10 percent of the male population of Fort Kent, or 120 men, went off to fight the war. Five of them never returned. 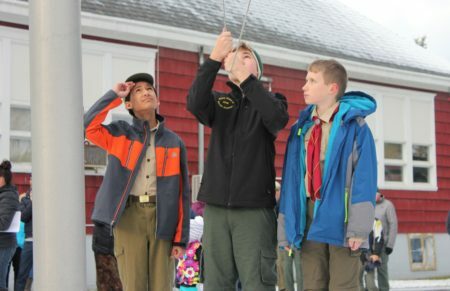 Members of Boy Scout Troop 189 raise a United States flag outside the Old Model School Building at UMFK on Veterans Day, Sunday, Nov. 11. 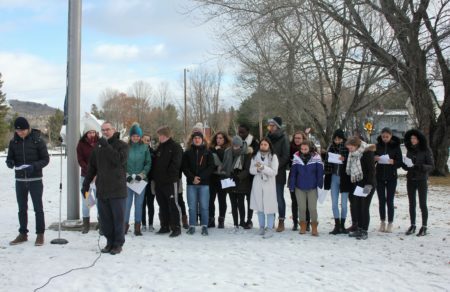 Chaperones for the French exchange students as well as educators in Cholet, Tanguy Vilboux and Juliette Heron, accompanied the students to the UMFK Acadian Archives earlier in the week where they learned about these local heros before reading Dabit’s poem at Sunday’s ceremony. Veterans from Forest Hill Nursing and Skilled Rehab in Fort Kent also attended the ceremony but due to cold weather and strong winds watched from inside a van parked on the lawn. The Forest Hill veterans waved at the crowd who cheered in appreciation for their service to our country.